The focus of this paper lies on the proof-theory for extensions of Logic Programming in which it is possible to draw negative conclusions both in a direct (i.e., based on a proof) and in an indirect (i.e., based on the lack of a proof) way. 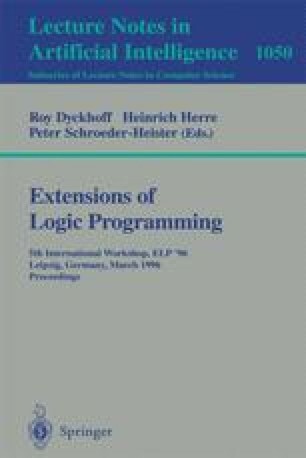 These extensions are provided with a rule-based deductive system in the sense of the work of Jäger  for Normal Logic Programs. Rule-based deductive systems can be used as a powerful tool to study the structural properties of the logic programming languages. Furthermore, in the deductive systems the fundamental semantical properties of the languages can be formalised by proof-rules of the systems. Therefore, different extensions of logic programming can be compared by comparing their deductive systems.